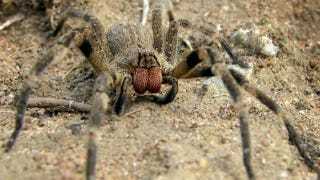 The venom of the Brazilian wandering spider has some seriously nasty effects, causing victims to lose control of their muscles, slowly lose the ability to breathe...and, if the victim is male, get an erection that lasts longer than four hours. That last part interested medical researcher Kenia Nunes, who saw the potential for the spider's venom as a possible treatment for sexual dysfunction in both men and women. She isolated the active ingredient in the venom that causes this painful condition, which is known as priapism. The ingredient, she discovered, was a peptide called PnTx2-6. When she injected it into a bunch of impotent lab rats, they soon returned to normal, healthy sexual function. Intriguingly, the spider's venom operates on completely different pathways than those utilized by drugs like Viagra. If the venom's active ingredient can be made safe for human use, then it might well be a huge help for people unaffected by standard erectile dysfunction treatments. And it might not be just men who benefit - Nunes believes PnTx2-6 can help women with sexual dysfunction as well, and that will be one of the focuses of her upcoming experiments. Via Discoblog. Image via DirJournal.